We’ve all seen it before, soaring through the air over just about every major sporting event in America you could think of. It’s as iconic of a sight as they come. You know it. You love it. Of course, we’re talking about The Goodyear Blimp! But, did you know it wasn’t always just a fun advertising tool? Years ago, The Goodyear Blimp served a very, very different purpose. Let’s talk a stroll back in time and take a look at the illustrious and surprising history of this famous airship. The Volunteer prepares for flight in 1937. When the Goodyear Tire & Rubber Company was first established in 1898, America was in the midst of the Industrial Revolution. Wanting to follow suit with the rest of the nation and continue to push boundaries, Goodyear wanted to explore a world beyond tires and rubber. It was then and there that Goodyear threw its hat in the ring of lighter-than-air balloons and aircrafts, and the concept for the Goodyear Blimp was born. Goodyear built the Wingfoot Lake Airship Base near Akron, Ohio as it’s aviation headquarters. This location remains one of the oldest airbases in the United States. 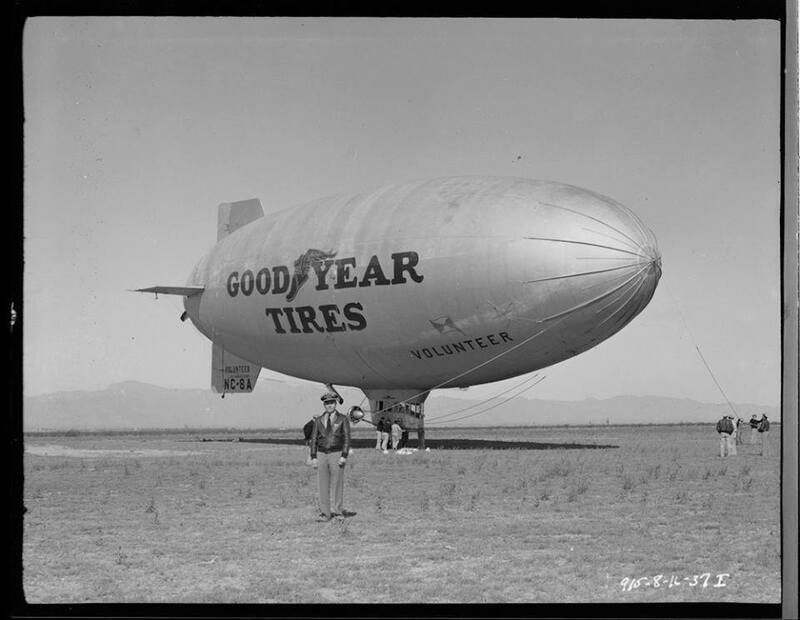 Through the early 1900’s, Goodyear designed and created balloons for competitions, until the first iterations of the iconic blimp, known as B-types and C-types, were created in 1917 for use by the U.S Navy. In 1919, Goodyear started operating its own airship fleet. Over the next several decades, Goodyear Blimps grew a reputation for excitement and romance as these ships were used for many different purposes such daredevil stunts, air shows, advertising, flying over sporting events (the Goodyear Blimps were a fixture at the Rose Bowl and made an appearance at the 1932 Olympics in Los Angeles) and transportation through different models like the Pilgrim, Volunteer, Mayflower and Defender. After the Japanese attack on Pearl Harbor on the morning of December 7, 1941, Goodyear’s blimps became immediately involved in defending America. 4 blimps were immediately transferred to the Navy, the airship Resolute patrolled Los Angeles’ harbor and over the course of the war, Goodyear produced 104 additional airships for the Navy. Goodyear’s blimps proved a valuable asset to the Navy due to the fact they could stay airborne for long periods of time and could be used for surveying. A plaque is dedicated at Wingfoot Lake dedicated to the nine airship pilots and crew that gave their lives to the development of lighter-than-air crafts during World War II. After the conclusion of the war, Goodyear continued to produce blimps for the Navy through the 60’s. But, it was also time for Goodyear to light up the skies again! The 50’s saw television programming explode in popularity, and the Goodyear Blimps were there to help. Using a camera and transmitter provided by NBC, Enterprise V became the first airship to provide areal coverage of the Parade of Roses in January of 1955. By the 60’s television was in full color and sporting events were getting bigger and bigger. Goodyear was there to see it all. Equipped with the best and latest tools, Goodyear Blimps were there to provide coverage for Super Bowl I and many more events. In 1967, Goodyear began equipping blimps with their own equipment, making them dependent from the networks. Through the rest of the century, Goodyear Blimps were an active broadcaster of countless televised events across the country including Super Bowls, the Indy 500, the Sugar Bowl, the Cotton Bowl, the U.S. Tennis Open, PGA Golf, Grand Prix Racing, The Kentucky Derby, the World Series, the Olympic Games and the Daytona 500 among others. While working through several iterations, models, sizes and styles of blimps, the current blimp is Spirit of Innovation and continues the storied tradition established by those before it. The Goodyear Blimp continues to be a fixture at sporting events, spreading goodwill, raising money for charity, providing the occasional air travel and, as a resident of the age of social media, posting on Twitter and Facebook.